By now we all see very clearly the iPhone and Apple summon. Follow the usual patterns of the brand have been maintained for years but what really the iPhone was the only name who studied at Apple for your smartphone? 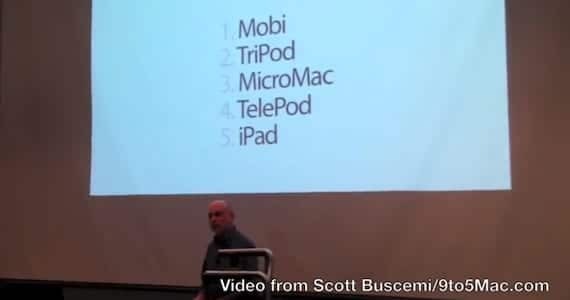 During an event at the University of Arizona, one of the creative exdirectores Apple, Ken Segall, said that before the name 'iPhone' were studied other possibilities as 'TELEPOD', 'Mobi', 'Tripod' and 'iPad'. TELEPOD was considered a futuristic word that mixed the term 'telephone' (telephone) and 'pod' which refers to his extended family of music players. Tripod comes to the fore front of him after seeing that had a mixture of three other device as: a phone, an iPod and a gadget for surfing the Internet. Little did they know at the time is that with the App Store, the iPhone now would be a device that can do many more things than they had in mind. iPad marks now used to refer to the Apple tablet but also had opportunities to become the name of your smartphone. Steve Jobs revealed at the time that they began to work before in a tablet than a phone , therefore, it seems that iPad was "reserved". The presentation can also see another title by the name of 'Micromac', however, is an invention of Segall to inspire public input, therefore, never considered calling Apple iPhone 'Micromac'. Article TELEPOD, Mobi, iPad, these are some of the names were considered before the iPhone was originally published in News iPhone . Passbook: Whose fault is it?